In-class small group session in New York. This class introduces the Lebanese language to beginners with pronunciation, basic grammar, gender, numbers, time telling and basic daily conversation exercises. People will be able to understand and speak essential Lebanese phrases, engage in simple conversations, and practice their question and answer dialogues. The Lebanese Latin letters LLL-System will be used for writing and reading. Schedule Five weeks: Two days per week, Monday and Thursday: 5:30 – 7:00 PM 10 sessions total of 15 hours.If you prefer other days, times, or location, please contact us to make arrangements. Age Group This class is designed for 16 year or older, a different program for children to be announced later. Registration deadline TBD. Registration will stop when the class is full. This is a small class (5-6 people) to allow personalized interaction with students. If you need to register after the registration deadline, contact Tony Faddoul. The instructor is one of the founders of the Lebanese Language Institute and abcLeb. Tony Faddoul co-developed the LLL-System and other educational methods for teaching Lebanese to English speakers over the past 15 years. He currently leads the development of the Lebanese language curriculum. 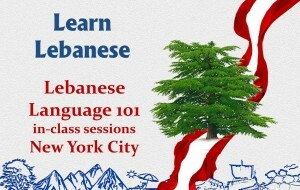 The 101 class for NYC is organized by Tony Faddoul, you can contact him directly if you have any questions.